Does anyone know what this flower is? It appeared in my Mom's flower garden this fall. We have no idea what it is or where it came from. It is about 5 feet tall and has new shoots coming up around it. I am wondering if it isn't just a well fertilized weed? What ever it is, it is sure beautiful. Edited: Please read Cyndi's comment to find out the name of this mystery plant. Thank you Cyndi!! You made my Mom very happy today. Now we are wondering where it came from??? We have never seen another plant in like it in our area. Have you? Hi Joan ... no, I don't think it's just a well fertilized weed ... my thoughts are it's a type of "Heather". Although I've never seen Heather grow quite that tall ... maybe that's where the fertilizing comes in!! Looks nice and healthy ... good luck!! Well Joan.. I am no green thumb and can't help you with the name of this but it sure is beautiful! Weed or not I would definitely keep it! Down here in Texas they grew more like a biennial instead of an annual, unless we had a really hard freeze, so the plants got very big! Oh my ... this is stunning! Cyndi mentioned "down here in Texas" ... so just maybe I can find one of these next year! Glad you've solved the mystery ... and happy to hear that it's 'safe'! I wanted to provide a couple links for those that may want to try and grow Amaranth themselves. Here the source of the seeds that I purchased. It is called Seeds of Change. They offer several beautiful, edible varieties. I know that you can purchase seeds elsewhere but I garden organically, so I wanted to make sure that my seeds were organic. 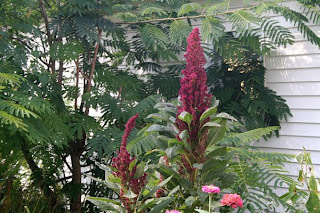 Also, here is a link to an article called Amazing Amaranth from a magazine called Mother Earth News. Of course my all time favorite Amaranth is this one called Love Lies Bleeding, but I don't think you can eat it - I just know that it is beautiful! I hope these links work, if not feel free to leave me a message on my blog under the 'Contact me' page and I will send you the information.